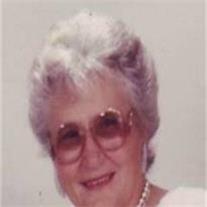 Gladys Adeline Tschetter went home on March 22, 2013 at Gilbert, AZ. She was born June 29, 1925 in Freeman, South Dakota to John JC and Barbara Gross . When she was a young child, her parents moved the family to the Huron area. She attended Huron Schools . When she was old enough, she worked at J.J. Newberrys store, where she met her husband, Theodore L. Tschetter. They were married November 5, 1946 at Smith Center, Kansas. In 1979, they moved to Colorado Springs where she worked for 12 years at a medical center, where she made many friends and was loved and respected. In 1998, after the death of her son, they moved to Arizona to be closer to their daughter and grandchildren. Gladys loved her family, especially the grandchildren and great grandchildren. Her pets were an important part of her life and she doted on them. Gladys enjoyed planting and growing beautiful flowers with her husband and filling up many photograph albums with pictures she took. She enjoyed making chocolate covered cherries and other fancy candies at Christmas time. She was an incredibly good cook and loved sewing . Being thankful for sharing her life are her daughter, Claudia Cope, brother, Walter (Linda) seven grandchildren: Susanne (Nathan) McCabe, Shelli (Kenneth) Brinkley, Shari (Dustin) Snow, Sawnya (Christopher) Sherwood, Thomas (Meredith) Cope, James (Celace) Cope, Jonathan (Candith) Cope and 25 great grandchildren and a very special cousin, Edna Mae Hofer. She was preceded in death by her husband, Ted, her son Anthony (Tony), her parents, 3 brothers and 3 sisters and her son-in-law and friend, Terry Cope.